Launched by Alan Cline in 2002 in memory of his plumbing sister, Beth, 1-800-PLUMBING® was created to provide the brand awareness and co-marketing benefits usually available only through franchising. Beth’s vision was different. She saw a way to bring real benefits to plumbing businesses, even if they choose to be independent. Since Beth’s premature passing, Alan has endeavored to build the service as Beth imagined it, and more. “This is a business idea that benefits everybody, without having to make a major investment,” says Cline. “Any contractor can benefit from this memorable number and an effective marketing plan.” It’s like having a friend in the plumbing marketing business. As a child Beth was involved in the local 4H Club. She was an avid equestrian, gardener, seamstress, and quite a talented singer and an artist. In high school, Beth Cline was on the boys track team – because there was no girls track team back then. She attended Goucher College in Towson MD. 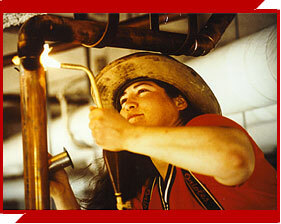 She began her plumbing career in Baltimore MD and became known as the “Singing Plumber” in her local community. Beth was an active member of the Baltimore Songwriters Guild and she sang the National Anthem at the new stadium, Camden Yards, where by the way, she’d done plumbing work. Beth was a unique individual. She was very intelligent, hard working, and determined to succeed. 1-800-PLUMBING was her brainchild – she secured the number over 15 years ago, and registered the trademark over 10 years ago. It was Beth’s dream to build a nationwide network of 1-800-PLUMBING contractors. Unfortunately, Beth did not see her dream come true. On April 9, 2002 Beth died of breast cancer at the age of 45. Beth’s brother, Alan, aware of the value inherent in 1-800-PLUMBING, decided to make Beth’s dream a reality.